Editor’s Note: The following guest post is from my wife Lauri, a pediatrician, presently in Guatemala serving as medical director for an interfaith medical mission trip with a team of Xavier University students, Rabbi Abie Ingber, Director of Xavier’s Center for Interfaith Community Engagement, and other health professionals. It is her fourth year to participate in the trip. A mere six months later, following an earthquake that killed 250,000 people but managed to spare our kids and all those in their orphanage, we were able to get Sophia and Henry out of Haiti and home to Cincinnati. I remember during those dark and fearful twelve days following the quake coming back to those words again and again: expect failure, be surprised by success. Would we be able to get them home? Each day there was the expectation of failure, but thankfully plenty of surprise at the successes. Well, every now and then in the practice of medicine we expect failure and are surprised by success. For those of you who are familiar with the Guatemala trip you already know a very special little girl named Luisa. I first met Luisa 3 years ago this week, just days after her first birthday. Luisa is the youngest of 7 children and her mother came to clinic that day with a sad heart. Having already raised children, she knew there was something fundamentally different about Luisa. She wanted to know why Luisa could not roll, sit, crawl, stand, walk, babble or talk like her other children did at age one. During my conversation with Luisa’s mother, Luisa herself was hidden from me, wrapped in her hand-woven peraje and tied like a sling to her mother. Without even laying eyes on her, I knew Luisa had a major diagnosis. As we pulled the baby out of the sling and put her on the exam table in front of me I saw a baby with profound quadriplegic, hypertonic cerebral palsy. She already had joint contractures, frozen up wrists stuck in constant flexion, and scissored legs. I finished my exam and sat down to have a hard conversation with Luisa’s mom. Doctors never want to give bad news. I told her I didn’t think that Luisa would ever walk or talk. The way most cerebral palsy patients die is from aspiration (choking) events that lead to pneumonia. Luisa had no gag reflex and that day she had pneumonia. I gave her mom instructions of how to keep moving her joints and told her to try to find physical therapy and occupational therapy to help her. I honestly thought that would probably be the last time I would see Luisa. Without proper nutritional support, treatment of future pneumonias, PT, OT, how could she survive in this little impoverished mountainside? 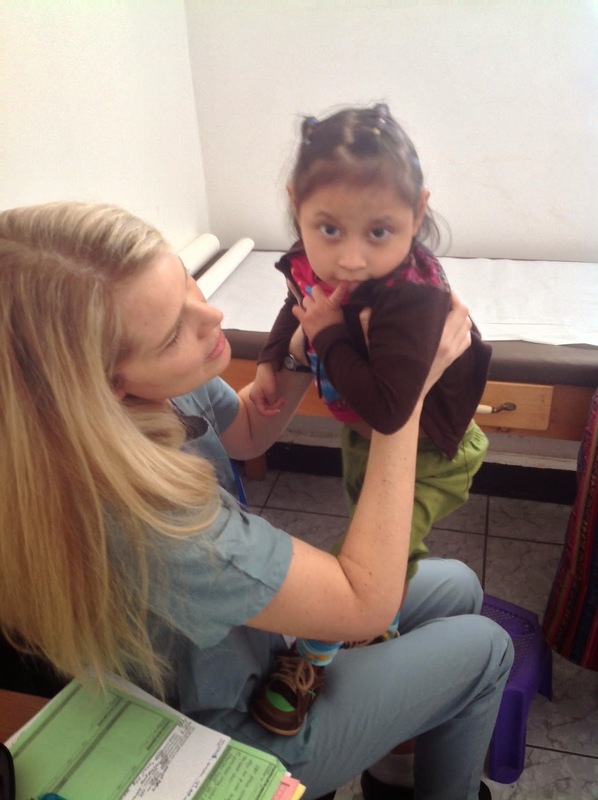 Luisa has become the star pediatric patient on each trip. She has so much to teach these future doctors, nurses, occupational therapists, and every year she teaches me. This year is no different. We arrived at clinic this afternoon and were still setting up all of the supplies that we had brought–a thousand pairs of glasses, suitcases full of medications, toothbrushes, hygiene supplies, etc.–when I looked to the entrance of the clinic to find three people WALKING into clinic holding hands. Luisa was being flanked on each side by her oldest sister and her mother, but she was lifting each leg and putting one leg in front of the other. She was walking into clinic. It took me several seconds to register what I was actually seeing. Luisa was walking. Her mother was gleeful to see my surprise and delight. Luisa turned 4 last week, last month she started walking with both hands held. For the last 3 years I had been expecting failure, today I was surprised by success. If you don’t believe in miracles, you need to meet Luisa. 5 Responses to "If You Don’t Believe in Miracles"
Thank you for this. A wonderful way to start off the New Year on a positive note! Good doctors diagnose and treat the body, while the best doctors fix the soul. Thank you for being the best. You are so very kind. But honestly, Luisa fixes my soul. She does the same for all of the Xavier students who fall in love with her every year. She is such a gift to all of us. It is tremendous to see these future doctors and nurses cheering her on – over the years – some are now in residency or out working as nurses – and still follow her story. She is hope, singing so beautifully. Such a beautiful story. Thank you. One little life holds so much promise. Ah, but I have met your wife! Thank you, Lauri, for that wonderful story. For the past two and a half years I have volunteered at a drop-in meal program for folks who are homeless or at risk. I see small and unexpected miracles there- someone who finds the strength to challenge addiction, or finds a room and has the joy and luxury of not having to be pushed out onto the street from a hostel bed at 9:00 am. It is a wonderful thing, in the midst of what appears to be failure, to be surprised by success.